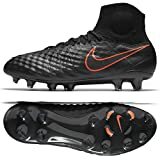 If you’re in the market for the best soccer cleats then it would be wise on you to read some reviews before just outright buying any cleat that aesthetically tingles your footy senses. It’s normal to fall in love with a cleats design and color scheme. Moreover if your favorite player wears the cleat then that just continues to peak interest. It’s always important that you consider the qualities each cleat has to offer and how it will help enhance your game. Never buy cleats like you would flashy sneakers! Soccer cleats aren’t designed to be taken for a stroll in the park. Each cleat has specific attributes with a specific type of player in mind. So let’s get into it and take a look at some of the best soccer cleats to keep an eye out for t.
As we write this the Puma One for the 2017-2018 boots is now available. They’ve been designed and painted with stunning colors in order to stand out among the best. It features a deep contrast of grey and white colors with some red applications on soleplate and sock liner. This boot also features the famous Puma Formstrip on its inside and outside. The Puma ONE football cleat combines the modern construction together with a Kangaroo leather upper so as to create the best comfort possible when striking and controlling the ball. This soccer cleats comes with a mixture of bladed and round studs. It’s accurate to say this is a cleat has a universal design so it’s great for any position. Stop and turn without fear of losing grip while still being able to explode into quick sprints when needed. This is the latest addition to the Adidas boot line-up and it will replace the Messi silo. This boot has been made with the real ultimate agility and it will be the third lace-less boot silo. It’s a great football boot and Messi will get to receive one for his signature editions, just the same way as Cristiano Ronaldo and his signature edition of Nike Mercurial Superfly boots. Knitted style upper covered in a thin film with raised dots to keep dirt and water out, but at the same time aid in an all-controlling first-touch. 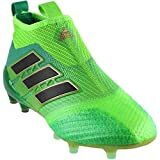 The Adidas Nemeziz are lightweight and is another best soccer cleat that is perfect for any position. You’ll notice the tongue is apart of the upper. Days of your cleat’s tongue annoyingly slipping to the other side of your cleat are now a thing of the past. The bladed studs structure is great for those of you who really like to dig on the field. If you’re a 0pmh-100mph then a cleat like the nemeziz would suit you well. This soccer cleat features a unique upper design in red and black and has a silver branding. The boot is designed to stand out among many brands due to its unique design. It consists mainly of black and red striking colors; it also features some kind of silver applications which are a great addition in making it look cool and stylish. This soccer cleat also comes with a tongue-less slip-on feature with a nice knitted sock part and its upper contains a texture of little dots which are for improving on the touch. The Adidas Gitch Fg cleat is the world’s first fully interchangeable football cleat. Although it has only launched exclusively in the UK (London). This is a cleat set to change the very way to we know and understand how a soccer cleat functions. This is a very unique type of the Adidas football silo, and it is the most ideal make that represents the modern way construction. This boot offers a lot of versatility to the players and its clean upper gives the canvas its creativity, and this has allowed Adidas to come up with a variety of designs which would not fit on their standard collection. The collection of these boots doesn’t show any signs of slowing down since they have become very popular. This football cleat features a leather upper with a synthetic lining to provide maximum comfort. It is lightweight and has a durable outsole to provide a firm grip on natural grounds. The Adidas Copa is one of the best soccer cleats on the market in 2017 and will go even beyond. The simple yet modernistic design keeps all that we value in the Copa cleat series while still managing to be relevant and more importantly useful. 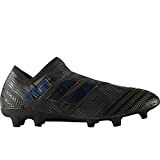 This is a great cleat if you’re not a fussy/flashy soccer player but still want an amazing cleat that will get the job done. Comfortable, durable and lightweight explosions are what this cleat has to offer. Conical Studs for the quick pivots and turns allowing your midfield maestros to take over the game without fear of slippage or rollover. There is also a very compressed feel that makes touching the ball soft and welcoming. The Adidas 17+ PureSpeed is made for the fast player whose advantage in the game is with pace. This cleat is full of qualities to increase your skills at high speeds. Most Importantly the Adidas X 17+ were designed to keep you comfortable for long, high-intensity sessions of footy. The upper is a knit, techfit compression that forms to your foot to get a great feel on the ball. Non Stop Grip technology is coated all over the upper to collaborate with the PURECUT lace less design to enhance ball control. The outsole is made up of the Adidas SPRINTFRAME, which is very light and durable for top quality traction. You’ll have no problem hitting your top speed with this cleat. This is good for creating good stability during very high-speed changes of direction. The bladed stud design is great for the explosive players who plans to use their speed to leave opponents in their dust. This men’s football boot features various colours that combines with almost identical shades of blue on both the inside and outside. Its sole plate has also been split into white and blue, and almost all its brands have been done in white. This boot gives the ultimate lockdown and strong touch with a high-cut design. The boot also comes engineered with 3-D texture and undated outsole which is for giving you a good grip on the ground. The Nike Tiempos cleats have been around as long as most of us can remember. This legendary cleat that embodies that all this is simple yet complex in players all over the world. This boot is very impressive and provides high quality comfort. It features a leather upper across its forefoot so as to provide the optimal touch to the ball. This model leaves everything very clean; since it has only 2 cross layers of stitching that are placed along the fold lines on its forefoot. From my point of view, this boot looks great visually and will greatly improve on your performance while on the pitch. The Nike Tiempos are another great cleat great for any position. The above are some of the best football boots for 2017-2018 seasons. They are great and have nice features. What are you waiting for? Hi there, nice post. I really like the Adidas evopower vigor cleats. They are super nice, cleats have really come a long way since I was a kid. Very nice and stylish these days. Do you have a brand that you would personally recommend? Thanks for sharing. The adidas nemeziz are probably the steal of the summer. Although many will argue the zebra pattern is annoying. This is why they just made and all black version as well. where is nike mercurial superfly 6????? Really enjoying the PureX17+ would recommend.